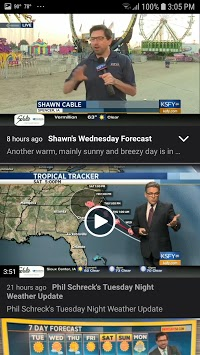 KSFY News Weather on the Go makes getting the latest weather easy. 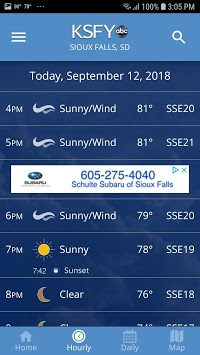 KSFY News Weather on the Go is a full-featured Android weather app that makes getting the latest South Dakota, Iowa, and Minnesota weather easy no matter where you live. 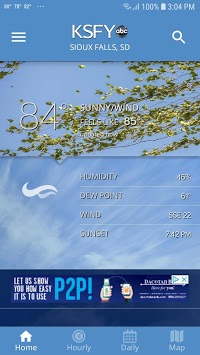 With a touch of the screen you can check current conditions, Titan Live Doppler, the Hour by Hour Planner and 7 Day Forecast, and get instant severe weather alerts here at home or anywhere in the USA. Whether you're planning your day or tracking severe storms, the most trusted weather team in the area will keep you in-the-know while you're on-the-go.